So not only does the VW Passat have one of the best adverts of 2011, but the Passat Estate has also been voted Top Tow Car of the Year. Again. 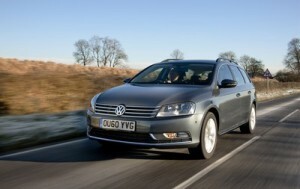 The readers of Caravan Times picked the VW Passat Estate as the winner from a choice of the UK’s 5 top tow cars. This is VW’s third Top Tow Car of the Year award it’s received this year, making it one of the top brands for caravanners. What is particularly pleasing for Volkswagen is that the Caravan Times award is a vote of confidence from the grass-roots caravanning community. The magazine is the largest online magazine for UK caravanning enthusiasts, and its annual awards are the only ones to be voted for by the public, rather than a panel of experts. Gaining the Top Tow Car of the Year award clearly indicates that the VW Passat Estate is proving itself as the beautiful yet functional and tough car that VW wanted to create. Chris Jeffries, editor of Caravan Times, praised the VW, saying it’s renowned for being safe, practical, economical and reliable. He goes on to mention the very tough competition that the VW Passat Estate had to triumph over this year in order to win the title. He is expecting that he will be seeing even more examples of the popular VW estate car at camp sites across the country during 2012. In the summer the Volkswagen Passat Estate TDI 170PS took another top towing title, this time the Tow Car of the Year award at the Tow Car Awards. This award perfectly complements the one from Caravanning Times as it was judged by a varied panel of experts from top magazines WhatCar? and Practical Caravanning and The Camping and Caravanning Club. And it gathered impressive compliments from the hard-to-impress judges. This time the VW Passat Estate was described as “borderline brilliant”. It was singled out for its impressive ability to give a relaxing drive even when towing a caravan, being practical and economical to tow with and its superior levels of interior space. In September other models in the VW stable took victory at the The Caravan Club Tow Car of the Year Awards. The VW Jetta won the overall title of the year, while the VW Touareg took another two prizes. If you’re interested in buying or leasing a new vehicle contact our sales team. Alternatively, visit our website where you will find new and used VW’s available for sale or on finance.